Sure that we were on to something, we decided to follow up last week's discussion of the State of British SF with Paul Kincaid and Nina Allan with a discussion about the State of Australian SF with editor/publisher Alisa Krasnostein of Twelfth Planet Press and bestselling Australian SF writer Sean Williams. While there is always more that could be said about trends, particular publishers, or individual writers, a fairly-wide-reaching conversation did manage to cover a lot in a little over an hour. The podcast also includes some recommendations for books we think you should check out if you're interested in current Australian SF. As always, we would like to thank our guests Alisa and Sean for making the time to be on the podcast, and hope that you enjoy the episode. See you next week! This week something special. Following on from conversations at the London Worldcon and articles by Martin Petto * and others, Gary and Jonathan are joined by Nina Allan and Paul Kincaid to discuss the state of British science fiction. Are we having breakfast in the ruins, or is there hope to be found on the bookshelves? Mentioned during the podcast, Gwyneth Jones's first new novel in six years, The Grasshopper's Child (now available from electronic retailers). Pick up a copy (it's cheap!) and discover or rediscover this marvelous writer. As always, our thanks to our guests. We hope you enjoy the podcast. *Correction: Martin Petto's name was spelled incorrectly in this post. Apologies for the error. Time to get back to the conversation and put the wonderful LonCon experience behind us. With episode 201, Jonathan and Gary sit down to continue their ongoing discussion of science fiction, fantasy and other stuff. The first episode of the three time Hugo Award nominated Coode Street Podcast went out to the world on Saturday 8 May 2010. There was no intention to start a regular podcast, or an ongoing conversation with and about science fiction, but that’s what happened. In the four years since we recorded that first episode little has changed except, we hope, a tendency to ramble a little less. The recording is still rough and ready (alas), and the conversation is still off the cuff and unprepared (happily). To celebrate the extremely unlikely event that we were recording our 200th episode, we decided to do something special. We invited our good friends Kim Stanley Robinson, Robert Silverberg and Jo Walton to join us in conversation at Loncon 3, the 72nd World Science Fiction Convention. A lively and interesting conversation was had, in what we think is one of our best ever episodes. Our sincere thanks to Stan, Bob and Jo for making their time available and being a part of our celebrations. Our special thanks to Liz Batty, Niall Harrison and the Loncon3 tech team who provided the space for nearly 200 listeners to watch the event, and who recorded it far better than we ever could. And an extra thanks to Sophie (aka Miss 12), who helped me to introduce this episode. Finally, a deep and heartfelt thanks to you, our listeners, who keep us recording this crazy thing ever week. As always, we hope you enjoy the podcast. More next week! On to episode 300! And we're back! After traveling for far too long and having had a wonderful time in London at what may have been the biggest and best WorldCon ever, our intrepid commentators are back on Coode St pondering (at length, alas!) 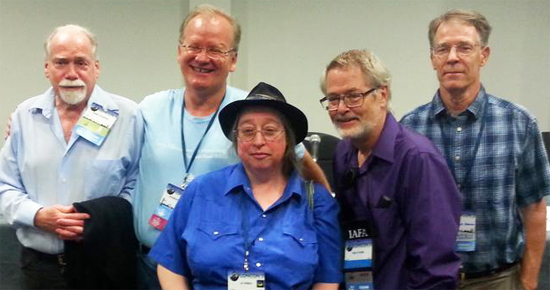 what made Loncon a success, the Hugo Awards results, and the future and purpose of SF (of course!). As always, we hope you enjoy the podcast. Next week: Episode 200!!! !